Hello NYC readers, looking for a great holiday party with a cause to attend? 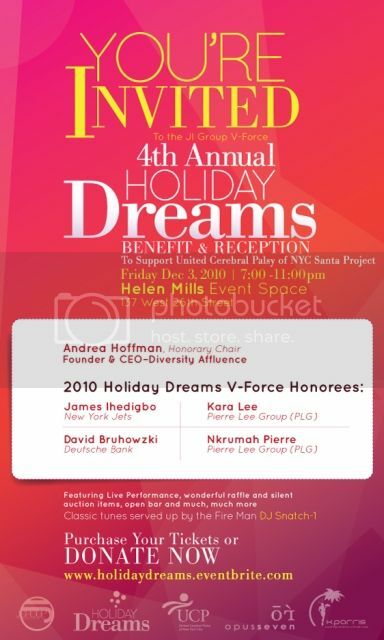 The 4th Annual Holiday Dreams Benefit and Reception will be held on December 3rd from 7 to 11pm in New York City. The event is being hosted by the JI Group V-Force, a team of young NYC professionals dedicated to volunteering their time and resources to positively enriching the lives of those in need, and will support the United Cerebral Palsy of NYC Santa Project. We've partnered with our friends at Diversity Affluence to sponsor a great contest for a winner to be the VIP guest of the event's honorary chair, Andrea Hoffman, President and CEO of Diversity Affluence. You'll also meet NY Jets player James Ihedigo, also an honoree. 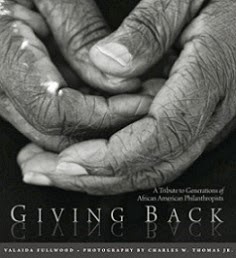 To enter, send a brief submission on why it is important for Blacks to Give Back to BGB@diversityaffluence.com by Wednesday, December 1, 2010. Entries must be received by 12 midnight EST and the winner will be announced on December 2. You must be 21 or older and live in the NYC metropolitan area. 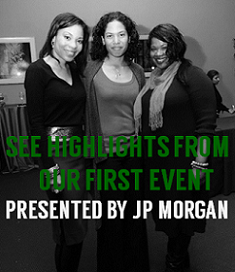 For more about the event, visit HERE, and to learn more about Diversity Affluence and the book, Black Is the New Green: Marketing to Affluent African Americans, see previous post HERE. Good luck!